In order to access hydrocarbon and geothermal resources, wells are drilled from the Earth’s surface all the way down to the underground reservoir. These wells must be tight so that fluids cannot leak from the reservoir to the surface in an uncontrolled way. This is achieved by installing steel pipes of progressively smaller diameter as the well is being drilled towards the target depth. These steel pipes are called “casing”. The space between the casing and the rock is filled with cement. The primary functions of this cement are to provide hydraulic isolation between geological horizons, to support the casing and to ensure that aggressive formation fluids do not come in contact with the casing. Any damage to the cement sheath between the casing and the rock is potentially dangerous since it may create permeable pathways from deeper to shallower depths and thereby compromise well integrity. Such damage might occur, for instance, when cement is detached from the casing as a result of thermal or mechanical loads. It is often believed that such detachment is prevented by improving the bonding between the cement and the casing. 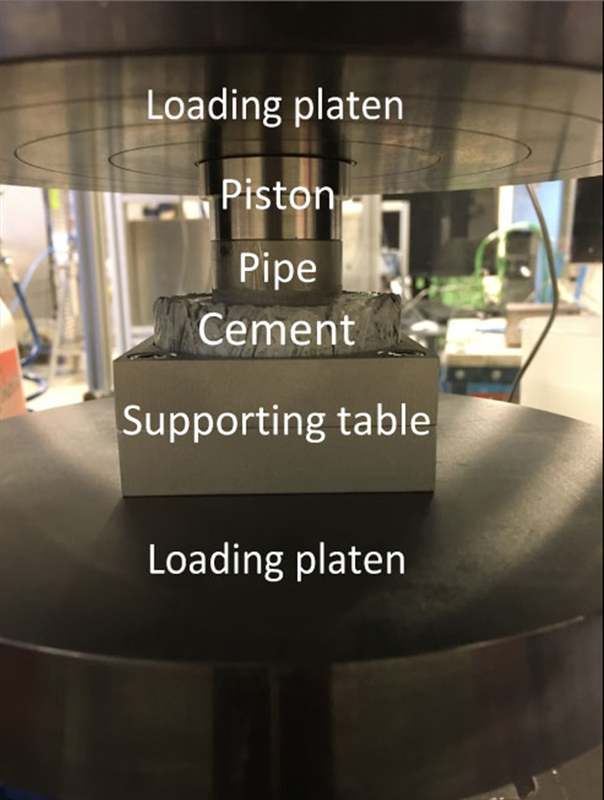 In an article published this month in Journal of Petroleum Science and Engineering, researchers from SINTEF Industry challenge the current paradigm of cement-steel bonding. You might also find this interesting: Electrophoresis to improve well construction? Bonding strength between cement and steel is commonly estimated through the so-called push-out test performed in the lab. In this test, a small-diameter steel pipe (diameter on the order of 1 cm) is placed in cement slurry. After the slurry hardens, axial load is applied to the pipe (Figure below). The maximum load that can be sustained before the pipe is pushed out of cement, divided by the contact area between cement and pipe, is called push-out strength, and is often accepted as a measure of cement-steel bonding strength. Even though the push-out strength is shear rather than tensile strength, it does indeed seem reasonable to assume that this parameter yields an estimate of the bonding quality. In order to serve as such, however, the push-out strength must possess one important quality: it should be a material parameter characterizing the adhesion at the interface. Setup for a push-out test with a cemented steel pipe. Photo courtesy: A. Stroisz, M.H.Bhuiyan. Is push-out strength material or structural property? In order to test if the push-out strength is indeed a material property rather than a structural parameter, we conducted a series of push-out tests with the same type of cement, but with pipes of different diameter. If the push-out strength is a material parameter due to adhesion, the measured values should be independent of the pipe diameter. Based on over 30 tests, our conclusion turned out to be the opposite: There is a strong size dependency, whereby the push-out strength decreases with the pipe diameter (Figure below). 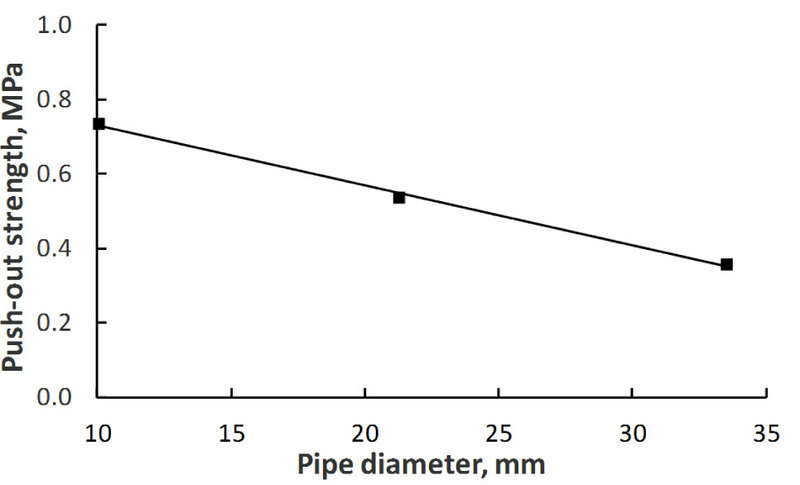 Push-out strength vs. pipe diameter: Size dependency is at play. Size effect is an old friend in materials science and fracture mechanics. In a nutshell, it means that larger objects have lower strength. For example, in our experiments, if the pipe diameter is larger, the contact area between steel and cement is larger. A larger initial flaw/imperfection may therefore be present at the interface. This will reduce the strength measured in the push-out test, just as we have observed. Another mechanism for strength reduction with pipe diameter may be cement shrinkage. In general, interfacial strength may be due to adhesion, friction, or a combination of the two. While the adhesive component of interfacial strength should not depend on the pipe diameter, the frictional component might do so, because the frictional resistance is proportional to the normal stress on the interface. No confining stress was applied to cement in our tests. However, cement shrinks during setting. Cement shrinkage creates normal stress on the pipe. This normal stress is smaller when the pipe diameter is larger (the shrinkage-induced stress would be zero if the cement-steel interface were flat). Smaller normal stress means that there will be smaller frictional resistance at the interface. Thus, our experimental results may also be explained by push-out strength being a measure of fictional resistance rather than adhesive strength of the interface. It is quite naïve to use the push-out strength obtained in laboratory tests as an indicator of bonding strength in the field. The reason is that the casing diameter in a real well is an order of magnitude larger than the pipe diameters used in the lab tests. In order to be used in well construction, the measured push-out strength must be properly upscaled. If the trend obtained in our experiments continues into larger pipe diameters, the bonding strength in the field is likely to be as low as zero. Push-out strength can still be useful as an indicator of bonding quality when comparing e.g. between different types of cement or surface finish in laboratory studies, as long as pipes of the same diameter are used in all tests. Experiments show that there may be more to cement-steel bonding than meets the eye. Future work should shed light on the underlying physical mechanisms governing processes at the cement-steel interface at microscale. This will facilitate design of new types of cement and casing coatings that will improve the bonding quality and thereby the well integrity at large.